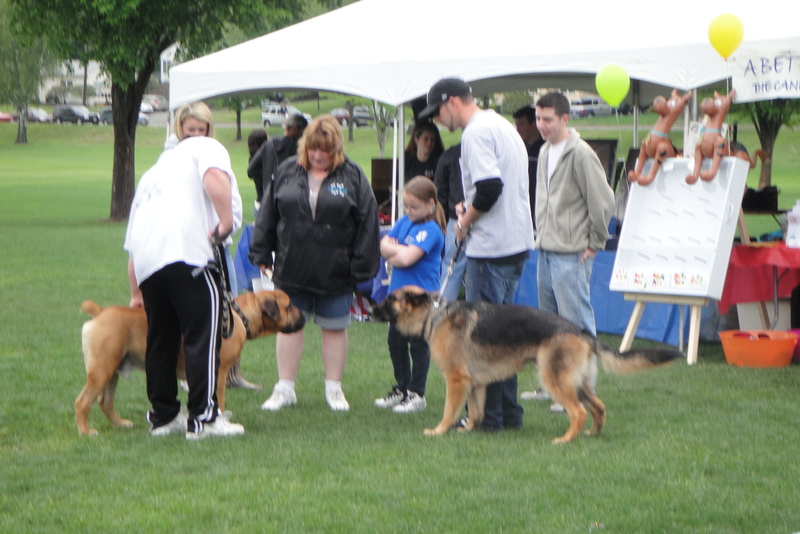 The company was wonderful even if the weather was not for the 4th Annual Paws 4 A Cure Walk on May 15 (aka the Soggy Doggy Walk). Georgia’s Legacy was proud to have a team this year and to walk in honor of brave pups from all over the country who have been affected by cancer. The entire weekend was special, and thousands of dollars were raised from the walk to provide financial assistance to pet owners who cannot afford critical medical care for their pets. Team Georgia’s Legacy alone raised nearly $600, which will directly help pets in need. But as I sat down to write this post, three things really stood out about the event for me. Without a doubt, the most touching part of the walk was a simple balloon release ceremony. 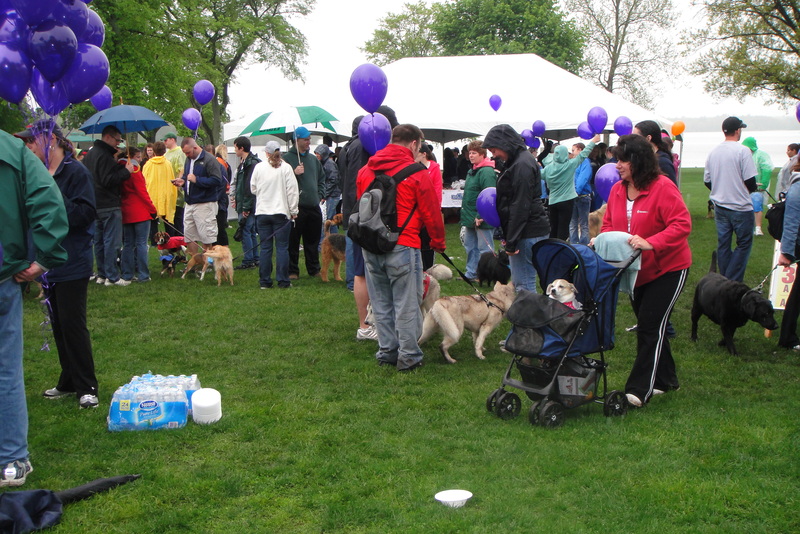 Each attendee had the opportunity to write a departed pet’s name on a balloon along with a message. Then, at once we released about 200 balloons to the heavens. Earlier in the day, it was looking a bit grim for the balloon release ceremony, as it was pouring rain. But eventually, the rain let up and we took that as an opportunity to take a balloon and write our messages. And as I began to write the names of each of the pup’s names in whose memory Team Georgia’s Legacy was walking, I was overwhelmed with a mix of emotions. It was yet another reminder of how many lives are touched by canine cancer each year and I was humbled to be given the opportunity to honor the memories of each of these brave souls. I felt so blessed to be able to give back in some small way to contribute to the mission of a great organization like Paws 4 A Cure to help other beloved pets in need. And of course, I thought about how much I still miss my own sweet Georgia and all of the other pups I have known who are now at the Rainbow Bridge. 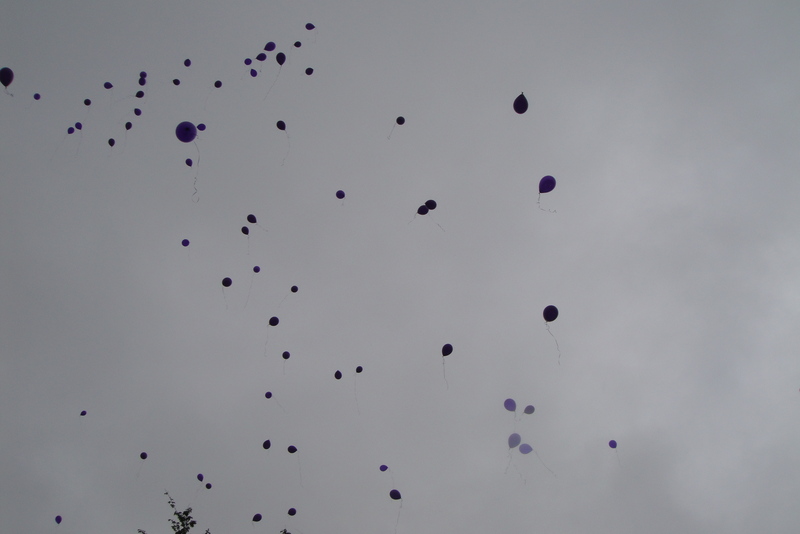 The baloon release ceremony was beautiful and touching and I have no doubt our messages reached the Rainbow Bridge. But then, together, the balloons were released, and I watched them gently float into the sky. And I felt a sense of peace and eternal connection to our furry angels. It was quiet and beautiful…and perfect. And it was comforting to know that I was not alone in missing my sweet little girl. That I was surrounded by so many other pet parents who were sending their love to their beloved angels too. It was a lovely, healing experience that I will never forget. 2. 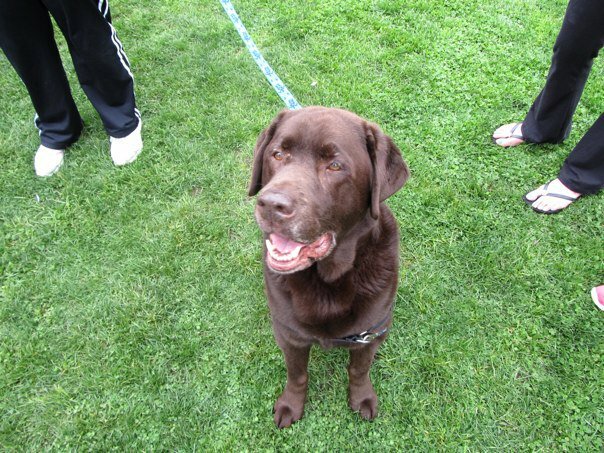 Sometimes HOPE looks an awful lot like a chocolate lab named Wilson. Of course one of the highlights of any dog event is meeting the other dogs. And not having my own sometimes-disgruntled bulldog with me, I was free to dote on some of the other pups enjoying the day. And I was reminded of why we fight so hard to beat this dreaded disease. There was Sammy, a gorgeous 4 year old St. Bernard who was recently diagnosed with lymphoma. Sammy is in the midst of chemotherapy, but it didn’t slow her down one bit for the walk. Meeting Sammy, I decided that she should be a poster dog for why more pet owners should consider chemotherapy if it is an option to treat their dog’s cancer. Looking at her, you would never guess that she was even sick. And not only did she walk the entire 3.1 miles around the lake – she even stopped to jump in for a quick swim on the way back! And standing next to her was her beaming dad, who you could tell would do anything to help her live the long and happy life that she deserves. I have no doubt that Sammy will continue to fight the good fight and I pray that she remains in remission for many years to come. Wilson is a 3 year cancer survivor...and one of the sweetest dogs you'll ever meet. And then there was Wilson, a 3 year cancer survivor. I was just one of many who joined his fan club that day. Handsome, sweet and extremely talented (we couldn’t get enough of the tricks he would do to win some more of the Dr. Becker’s Bites treats in our pockets), Wilson will steal your heart with his big brown eyes and loving soul. Wilson’s journey with cancer began in March 2008. His mom Amanda, who also happens to be a vet tech, found a wide, flat growth on the front of his foot while doing his nails one day. Mast cell didn’t even cross her mind, because the bump had normal fur on it, but that’s what it was. He had surgery right away, but the entire tumor couldn’t be removed because of the size and location. Thus began a long struggle that included more surgeries and 24/7 care as Amanda worked with her vet team to help Wilson become cancer free. At one point, amputation was even discussed because Wilson was having so many complications from the treatments, but with hip displaysia, that was a daunting option. Instead, they tried one more drastic surgery to remove the cancerous and damaged tissue and did a skin graft to try to heal the wound. And it worked. Wilson now wears a “Badge of Courage” on his right rear paw – a big scar where the tumor occurred, and he has had to have 3 additional tumors removed in the past year (thankfully with no complication), but Wilson is still here, still going strong and still loving life. 3. Pet lovers are the best people on earth. The Paws 4 A Cure walk was very special to me because I was finally able to meet in person some of the people that I have known for years online through the Pet Cancer Support forum. People who had been there to support me day in and day out during Georgia’s battle with cancer and while I was picking up the pieces after she passed. People who I count among my dearest friends even though we live in different parts of the country. And in spending time with Keri, Jen, Teresa and Andrea (and Chee who was the star of the whole Walk), I was again reminded that with all its heartache, sometimes the worst moments in life come along with some pretty amazing blessings. Our dogs had brought us together and have created a bond between us that is truly special, and I am grateful for those friendships every day. 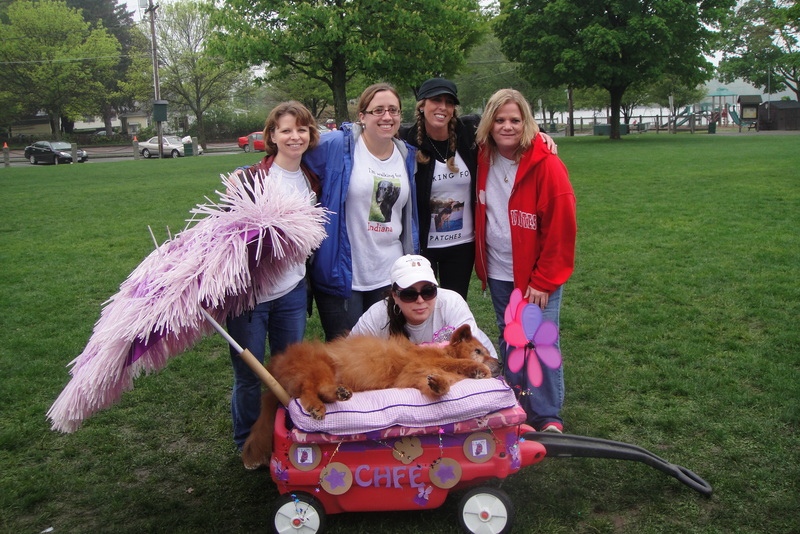 Me with my dear friends from the Pet Cancer Suppor forum along with the beautiful Chee in her 'Cheemobile" - tuckered out from celebrating her 14th birthday during the Walk festivities. And then there were the others at the walk. The volunteers who helped run the event, the great assortment of vendors that participated and shared their information and products with all of us, and of course, all of the devoted pet owners who came out to support Paws 4 A Cure even in the pouring rain. It was a true testament to not only how much people believe in the mission of Paws 4 A Cure, but also how much they love their dogs. Everyone made the best of things until the rain finally let up and most of the dogs didn’t even seem to notice – they were having too much fun meeting each other and all of the people there. Dogs of all shapes and sizes came out to the walk with their people. A HUGE thank you to everyone who supported Team Georgia’s Legacy this year and all of the vendors and participants who helped make this year’s walk so special. And if you live near Wakefield, MA, please plan to join us again next year for this wonderful event. And to learn more about Paws 4 A Cure, visit www.paws4acure.org. This entry was posted in News, Stories of Courage and tagged canine cancer, canine lymphoma, dog cancer, dog cancer event, dog cancer walk, Georgia's Legacy, mast cell cancer, Paws 4 a Cure. Bookmark the permalink. Beautiful, Kerry. So perfectly said, as always.